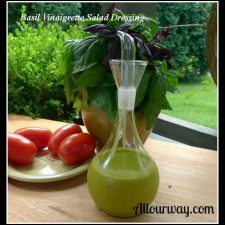 Basil in our basil vinaigrette dressing is one of those herbs that you either have too much of or not enough. We really like our basil . . . .we wouldn’t think of having an herb garden without it . . . .
. . . . but we got a late start in our planting and we couldn’t find any plants. We went to Lowe’s . . . . we went to Menard’s . . . .we went to the local nurseries. We ended up finding the basil 75 miles away from home. The plants . . . . two Italian sweet and one purple basil. . . . . . . . were a little puny. . . . so we crossed our fingers and hoped for the best. This year the weather was close to perfect . . . . temps not too hot and an ample amount of rain. The little herbs took off like wildfire! Before we knew it the plants were starting to flower! Next thing I knew I was cutting bunches of basil and putting the stems in water-filled vases. Do you know what happens when you put basil stems in water? Yep!! Exactly! The basil starts to root and then we have more plants to stick in the ground. As of today, we have more than half a dozen plants that are growing like crazy. We don’t know how this is going to end. 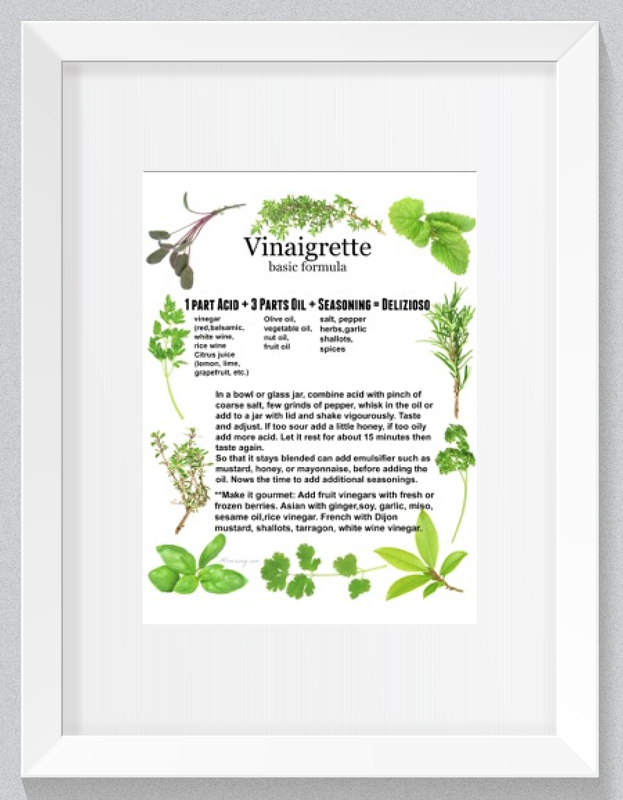 We really like this herb . . . . we do . . . . and we like pesto . . . . but you can only make so much pesto. 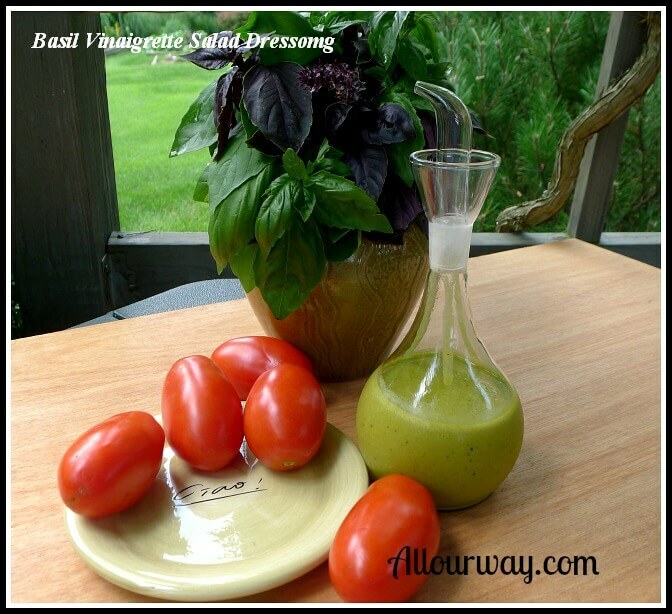 This is how we came up with the idea to make a Basil Vinaigrette Salad Dressing. I’ve mentioned how much we like our tossed salad . . . . we have it every night . . . .
. . . .making a salad dressing is the perfect solution for using the wonderfully aromatic leaves! 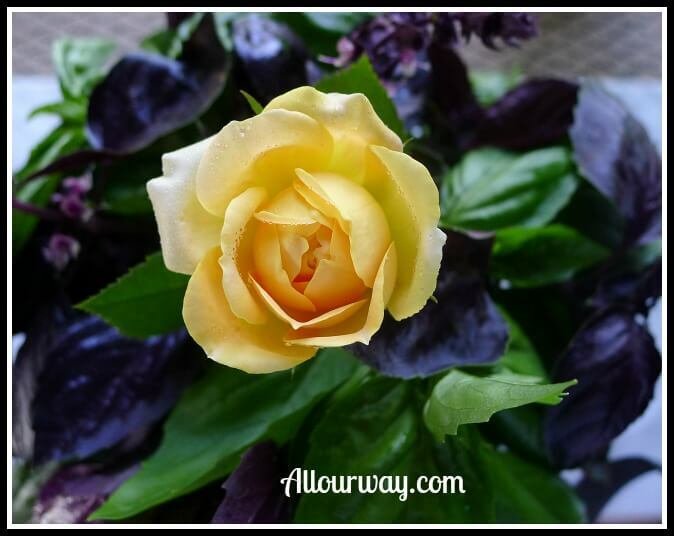 We can’t imagine not growing this wonderful herb . . . . in Italy it’s become a symbol of love. Italianicious.com tells of Italian women wearing a sprig of basil in their hair, as a sign they were looking for love, while Italian men would place a sprig of basil in their hair in an attempt to win over their woman’s heart.